Once a prosperous mining village, Derby is now a classified historic town. 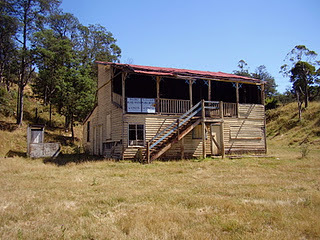 You’ll find it 103 km north east of Launceston on the banks of the Ringarooma River. 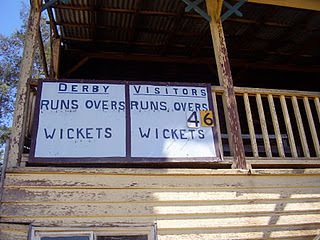 The grandstand and scoreboard are relics and, if they are still standing, should be heritage-listed. Derby has had a few sporting teams over the years. 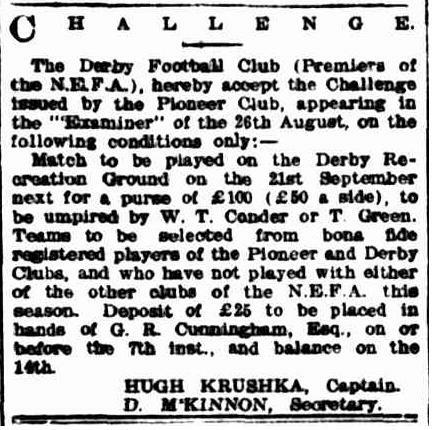 A 1912 newspaper article promoting an end of season challenge match between Derby and Pioneer suggests Derby Football Club won a flag 99 years ago in the NEFA (North East Football Association?). Derby also won flags in the North Eastern Football Union in 1949, 1950, 1953, 1954, 1957, and 1960. It played its last game in 1972, while the cricket club hung on until 2001, according Beyond the Big Sticks, an excellent book by photographer Ian Kenins and journalist Paul Daffey. At one stage there was a Derby Football Association, where clubs vied for The Diggers Cup. Thanks to John of The Holyboot Football Emporium for the reference to Beyond the Big Sticks. Alas, the book -published in 2003 – is now out of print. Thanks for the book tip @theholyboot. Didn’t know about the bell. Paul Daffey is a terrific writer, I would love to get hold of a copy of the book. Went past here on a road trip in late Sept. Stopped to take a couple of photos, and Derek, a dairy farmer from across the road trundled over and filled me in about the history of the field, grandstand and the area in general. Y’know, “born in that red house there over the valley, moved over this side a few decades ago”. Tremendous stuff. He was telling me that they’ve got some money from the govt to renovate the grandstand sometime next year. (2013). There’s also a broken pipe uphill from it and the wing closest to the road now resembles a bit of a river with some serious erosion going on, so i dunno what they’re planning on doing about that. 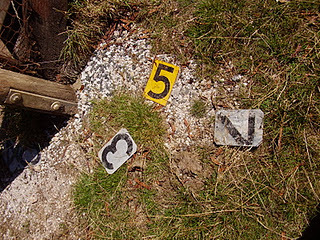 Came back the next day and took a few more from the top of mine cuttings behind the ground. Derek came roaring up the hill on his four wheeler and shared a little more about the area. I’ve got that book “Beyond the Big Sticks” too, you should be able to track it down somewhere, I picked it up in a Borders around the mid/late 00’s. Anyway superb site, Vin. And a great couple of photos, Chris. Good to see the Boot commenting here too, Aussie Rules has such a rich deep history that most people easily overlook in focusing on the AFL. You guys are doing a great job of preserving it. Leon, Thanks for your kind comments, and terrific extra info about the Derby ground. Good stuff. You’re welcome to send through any photos you may take of scoreboards and grounds: footy, cricket, bowls, tennis…Cheers. Vin. No worries, Vin. I did a little more research and this ABC Tasmania news story (which would have been about a week before I went by) popped up on google. Hopefully good news. Derek the farmer appears about halfway through. He’s the fella wandering around with the camera ppl. That news item from ABC Tasmania News is a beauty. Thanks heaps.